Humans, by most estimates, discovered fire over a million years ago. But when did they really begin to control fire and use it for their daily needs? That question – one which is central to the subject of the rise of human culture – is still hotly debated. A team of Israeli scientists recently discovered in the Qesem Cave, an archaeological site near present-day Rosh Ha’ayin, the earliest evidence – dating to around 300,000 years ago – of unequivocal repeated fire building over a continuous period. These findings not only help answer the question, they hint that those prehistoric humans already had a highly advanced social structure and intellectual capacity. Excavations in Qesem Cave have been ongoing since 2000. The team is headed by Profs. Avi Gopher and Ran Barkai of Tel Aviv University. Dr. Ruth Shahack-Gross of the Kimmel Center for Archeological Science at the Weizmann Institute has been involved in this archaeological research since excavations began, and she collects samples on-site for later detailed analysis in the lab. 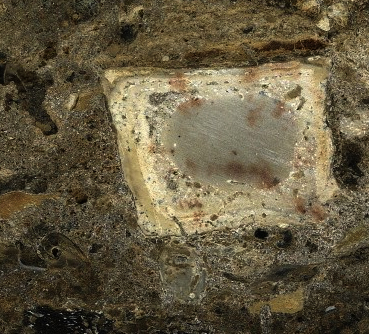 Shahack-Gross, whose expertise is in the identification of archaeological materials, identified a thick deposit of wood ash in the center of the cave. Using infrared spectroscopy, she and her colleagues were able to determine that mixed in with the ash were bits of bone and soil that had been heated to very high temperatures. This was conclusive proof that the area had been the site of a large hearth. Around the hearth area, as well as inside it, the archaeologists found large numbers of flint tools that were clearly used for cutting meat. In contrast, the flint tools found just a few meters away had a different shape, designed for other activities. Also in and around the area were large numbers of burnt animal bones – further evidence for repeated fire use for cooking meat. Shahack-Gross and her colleagues have shown that this organization of various “household” activities into different parts of the cave points to an organization of space – and a thus kind of social order – that is typical of modern humans. This suggests that the cave was a sort of base camp that prehistoric humans returned to again and again. “These findings help us to fix an important turning point in the development of human culture – that in which humans first began to regularly use fire both for cooking meat and as a focal point – a sort of campfire – for social gatherings,” she says. “They also tell us something about the impressive levels of social and cognitive development of humans living some 300,000 years ago.” The researchers think that these findings, along with others, are signs of substantial changes in human behavior and biology that commenced with the appearance in the region of new forms of culture – and indeed a new human species – about 400,000 years ago.